At Children’s Podiatry Clinics we have a special interest in the growth and development of Children’s feet. Pain in a child’s foot, ankle, knee, hip or lower back is never considered normal. We don’t believe in “growing pains.” Any pain that lasts more than a few days, or that is severe enough to limit the child’s walking, should be evaluated by an appropriately qualified Podiatrist. A newborn’s feet are soft and pliable, because they’re made mainly of fatty tissue (muscles, ligaments and tendons) and soft cartilage, which changes into bone as their feet grow. A child’s foot will double in size by the age of one, and they are approximately half their adult length by 18 months of age. Your child’s feet are literally the foundation of their body. They are a complex network of bones, joints, tissues, muscles and nerve endings that all work together to co-ordinate motion in the rest of their body. When something is out of balance in that complex network, the impact can be felt throughout their whole system. It is important to always treat foot pain to avoid life long problems that may occur as a result. 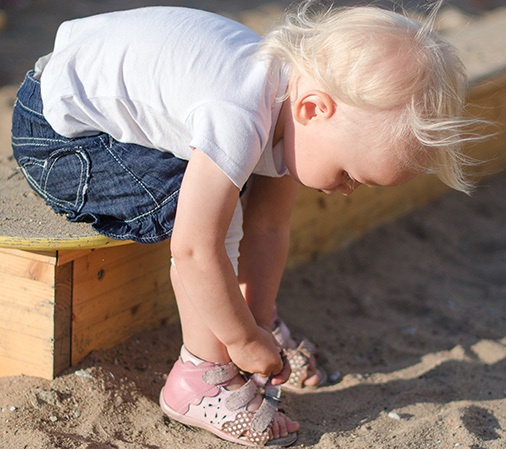 If you’re concerned about your child’s feet or you’ve noticed a change in the way they walk, it’s best to consult with our team of Podiatrists’. Please call (03) 8645 9845 to make an appointment.